YAROSLAVL, Russia, Sept 8, 2011 (AFP) - Russian President Dmitry Medvedev on Thursday slammed Russia's poor record on aviation safety and demanded a through probe into a plane crash that killed 43 people including members of a top hockey team. "I've given an order to the Investigative Committee and the government to conduct a thorough investigation," he told officials. "The situation remains unfortunate, and a string of air crashes which happened this summer shows that. We cannot go on like that." Russia on Thursday mourned the deaths of 43 people including top ice hockey players in a plane crash as President Medvedev planned to visit the site of the disaster. An aging Yak-42 plane carrying three-times Russian champion ice hockey team Lokomotiv Yaroslavl including several former and current NHL stars crashed on Wednesday near Yaroslavl, 300 kilometres (185 miles) northeast of Moscow. The crash occurred on the eve of a scheduled visit by Medvedev to the city to address a political conference, but now the Russian leader is also planning to tour the site of the country's latest transportation catastrophe. The two survivors -- player Alexander Galimov and crew member Alexander Sizov -- were in a grave condition. "They are still alive," said the spokeswoman, noting that Galimov received horrific burns to 90 percent of his body. 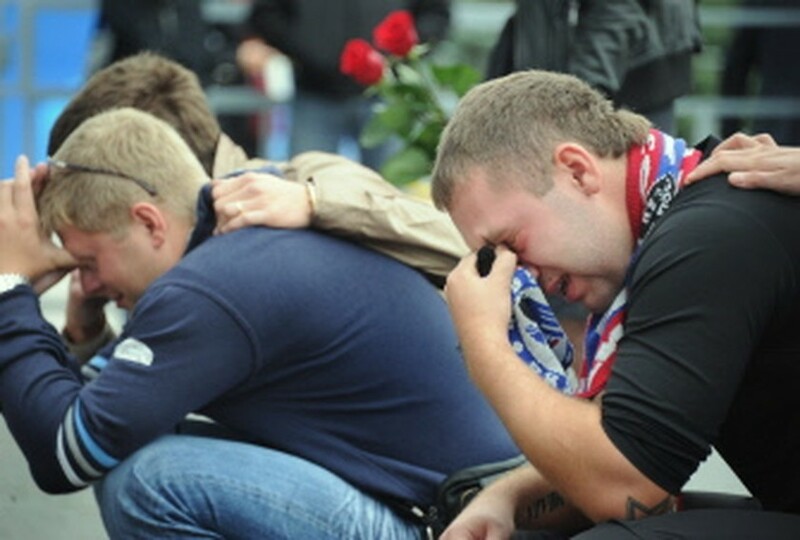 Russians across the country mourned the loss of some of the country's best sports talent and decried the country's disastrous record of air safety. "Lokomotiv was one of Russia's strongest and most beloved teams," said broadsheet Kommersant. "Tragedy in Russia and in world hockey," echoed opposition newspaper Novaya Gazeta. "Another black day in Russia's modern shameful history," actor Alexei Devotchenko wrote in a blog. "Never in my life have I seen so many weeping men," said Lyudmila Shabuyeva, a correspondent with popular Echo of Moscow radio station in Yaroslavl where authorities announced a three-day mourning period. In a grim twist of fate, Medveded had been set to address the annual two-day political conference at Lokomotiv's hockey arena, which has now become a sombre vigil site with thousands of fans placing heaps of roses and team scarves there. Russia's latest crash forced the Kremlin to change Medvedev's plans for the conference, saying the president would tour the scene of the disaster and hold an emergency meeting instead. At the conference designed to tout Russia's economic and political clout the Kremlin chief was also scheduled to meet with Turkish President Abdullah Gul and UNESCO Director-General Irina Bokova. Among those killed were the team's Canadian coach Brad McCrimmon -- a former assistant with the NHL's Detroit Red Wings -- goalie and former Swedish Olympic champion Stefan Liv as well as Slovak ex-NHL standout Pavol Demitra. Three Czech stars -- Jan Marek, Josef Vasicek and Karel Rachunek -- were also among the dead.